While more than half of U.S. states, including the District of Columbia, have legal medical cannabis, it remains illegal under federal law. Being such, the Food and Drug Administration does not regulate derivatives of the plant, including CBD. Products containing CBD cannot receive a certified “organic” label. In a 2017 study published in the Journal of the American Medical Association, researchers from the University of Pennsylvania bought 84 commercially available CBD products on the internet and had them tested by an independent lab. The test results found that only 31 percent of the products tested contained the actual dose of CBD as advertised on the label. Twenty-six percent contained less CBD than the label indicated and 43 percent contained more. By state regulation, any product containing cannabis extracts must contain less than .3 percent THC. To verify the chemical composition of ingredients and the purity of products, labs provide testing, cannabinoid extraction, refinement, and product developing to businesses around the state. Companies also send samples out of state to be tested in third-party labs in Massachusetts. In all areas of the Vermont CBD market, makers and sellers have adopted their respective approaches to the frequency and thoroughness of testing. At Maple Plus, the CBD extract that Mercury purchases is tested before it’s added to the maple sugar. Before the maple sugar goes to market, a sample is tested by a lab in Waterbury. Batch numbers are stamped on every box, and the test results are available on the Maple Plus website. Elmore Mountain Therapeutics in Elmore, Vt. produces whole-plant CBD extract in a sublingual tincture and a topical balm. Each batch the company releases is tested by multiple labs, and the results are also listed for reference on the company’s website. “We use two different labs to test for potency, purity, and contaminants and we feel very confident about the results,” says Ashley Reynolds, who runs the business with her husband, Colin. Other makers want to see more accountability and higher standards for products. “I feel like there’s not a lot of standards in the state and there’s not a lot of information so people are doing whatever they feel like,” says Waters. 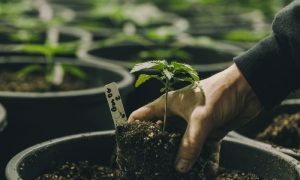 The lack of standards, he explains, can lead to products that are inaccurately labeled or contain “hot hemp,” or cannabis that has too high concentrations of THC. “It’s really up to the store owners to check what they sell,” he says. “You don’t just want to buy something that says ‘CBD.’ It’s up to us to police our own store.” Waters says he demands test results from makers wanting to sell products in his store and emphasizes that no one should be in the business if they can’t afford to test. Kearn says more CBD products are coming into the state from Colorado, California, Kentucky or as far away as Denmark. With some of these products, it can be difficult to verify where the plant was grown, which parts of the plants were used, and which extraction methods were used to obtain the extract.